Our St. Louis Area Yarn Crawl is only a scant two weeks away! The Summer's Last Blast Yarn Crawl will take place Friday, July 28 (10 am to 7 pm); Saturday, July 29 (10 am to 5 pm); and Sunday, July 30 (Noon to 5 pm). It includes five area shops: The Bead Place, Hearthstone Knits, Kirkwood Knittery, Knitorious, and us, The Weaving Dept. Look for the Passport to print out (or grab yours at the first shop you go to) on the Summer's Last Blast Yarn Crawl Facebook page. Get those passports stamped to be entered to win a Globe Trotter prize or a $50 Gift Certificate from one of the participating shops! The Weaving Dept. is Ready for You! The Weaving Dept. has been getting prepared with some fun things for this year's crawl including some brand new yarns, planned demonstrations in different types of weaving, and a fun community yarn bomb project for our store front. All these things are getting us really excited here at the Weaving Dept., and we can't wait to share them with all your lovely faces! For now, here's a look at a special yarn getting packed up in Seattle just for us and you for the crawl! Hazel Knits is packing up a special order just for the Weaving Dept. Make sure you make it in to see these colors in person! Hazel Knits has so many rich tonal colors that just seem to have so much vitality. Wendee and Dave have been perfecting their craft since 2007, and we feel very lucky to be able to bring you some of our favorite colors to you this Yarn Crawl. May be machine washed on gentle cycle and machine dried at low temperature. If your washing machine has an agitator post, please wash your garments in a mesh laundry bag to prevent the item from wrapping around the post. From Now until February 10th we're offering 20% OFF the pattern and any Berroco Yarns to make the Mrs. Watson. We’re going to have a Cast On “Party” at the shop Wednesday, February 1st from 5:30 p.m. to 8:00 p.m. Casey will be on hand in case anyone needs help with the pattern. If you get stuck, the staff are always happy to help in person. We'll post updates on our Ravelry Group. Also, this is where you can chat about your progress and share pictures! It's October, or rather, Socktober, again; and we have some things in store for you! First, and most importantly, the Weaving Dept. is having a SOCK DRIVE! We will be collecting NEW white socks in MEN'S sizes to donate to the STL WINTER OUTREACH. You can also donate to the STL Winter Outreach directly. Toe-Up Afterthought Heel Socks Class is a group class taught by Casey. Learn to make a toddler sock from the toe-up with an Afterthought Heel. This will give you the basics to make socks of any size. Basic knowledge of Knit stitch, Purl stitch, Increases, and Decreases required. Yarn, Needles, Pattern, and Instruction $48. October 19 & 26, 10:30 am to 12:30 pm. Two-at-a-Time Socks Class is an advanced group technique class to learn how to make two socks at once, on one set of needles, ONE INSIDE THE OTHER. There will be pre-class work to complete before the class begins. You must have made socks before and understand sock construction. Understanding of or experience with knitting with both hands and/or Double-Knitting would be helpful but is not required. We will make one small pair of socks using the top-down method to get the principles and technique down. Bring two balls of Plymouth Yarn Dream Baby DK of distinctly different colors, and your preferred needles for working in the round, size 4 or 5. The recommendation is a set of 5 DPNs. Also bring one small crochet hook (for "just in case"). Two 2 hour sessions; $42. October 12 & 19, 6:30 pm to 8:30 pm. School is in, Autumn is coming, and we're dreaming of sweaters, socks, and shawls! Come in the shop today to look at our extensive stock of yarns and notions. And maybe sign up for some of our classes, or come by for a DEMO! Beginning Knitting Class is a group class taught by Casey. It's a class for those that want to move beyond Casting On and the Knit Stitch. Learn to Knit in the Round, Purl, Increase, and Decrease while making a small cowl. This is an 8-hour Class done over 4 weeks. Yarn, Needles, Pattern, and Instruction for $74. Contact the shop to sign up today! Sept.13, 20, 27, and Oct. 4. 10:30-12:30. Have trouble blocking shawls? or Never blocked a shawl? Come in September 10th promptly at 1:00 p.m. to watch the DEMO! We have 2 Classes starting this month plus a Make-and-Take demo and Spin In! Look below for more details! Please note that for our scheduled classes, we need payment up front to hold your spot. Otherwise, the day before we will call on alternates to fill your spot in class. This is in fairness to our instructors. Intro. to Knitting Class is a group class taught by Casey. Learn to Cast On, Knit, and Cast Off while making a chunky cowl. This is a 4-hour class done over 2 weeks. Yarn, Needles, Pattern, and Instruction for $34. Contact the shop to sign up for either our Friday class (April 8 & 15, 10:30am-12:30pm) or our Saturday class (April 9 & 16, 2:00pm-4:00pm). Our Put a POM POM On It! Make-and-Take and demo day will be April 16th from 10:30am-1:30pm. Come learn to use Clover pom pom makers to make an exceptional pom! Also, we will provide yarn for you to make your own for $3! Spin In! is on April 23rd this month. Bring your spindle or wheel from 1:00pm-4:00pm to spin with others! Share with others that love fiber as much as you! If you want to know more about spinning, this is a good time to come watch the process of spinning and get some information. Classes are Starting in March! We have several classes beginning in March. If you're a new knitter, a want-to-be knitter, or know someone that wants to learn. Our beginning classes are for you. And for the experienced knitter, we have a sock class. Intro. to Knitting is our very beginning beginners class.Learn to Cast On, Knit, and Cast Off while making a chunky cowl. This is a 2-2 hour class done over 2 weeks. Yarn, Needles, Pattern, and Instruction for $34. Wednesdays, March 2 & 9 from 10:30 am to 12:30pm. Contact the shop to sign up. Beginning Knitting is our second beginners knitting class. This class is made for students that already know the basic knit stitch and are ready to learn more. Learn to Knit in the Round, Purl, several increases and decreases while making a small cowl. This is an 8-hour class done over 4 weeks. Yarn, Needles, Pattern, and Instruction for $74. Saturdays, March 12, 19, 26, and April 2 from 10:30 am to 12:30 pm. Contact the shop to sign up today! For our more experienced knitters, we have our Toe-Up Afterthought Heel Socks Class. Learn to make a toddler sock from the toe-up with an Afterthought Heel. This will give you the basics to make socks of any size. Basic knowledge of the knit stitch, purl stitch, increases, and decreases required. Yarn, Needles, Pattern, and Instruction $48. Saturdays March 12 & 19 2:00 pm - 4:00 pm. These are all group classes; but, as always, we have staff that teach individual classes on knitting, crochet, spinning, and weaving. Please call the shop at 314-921-7800 during business hours for more information. 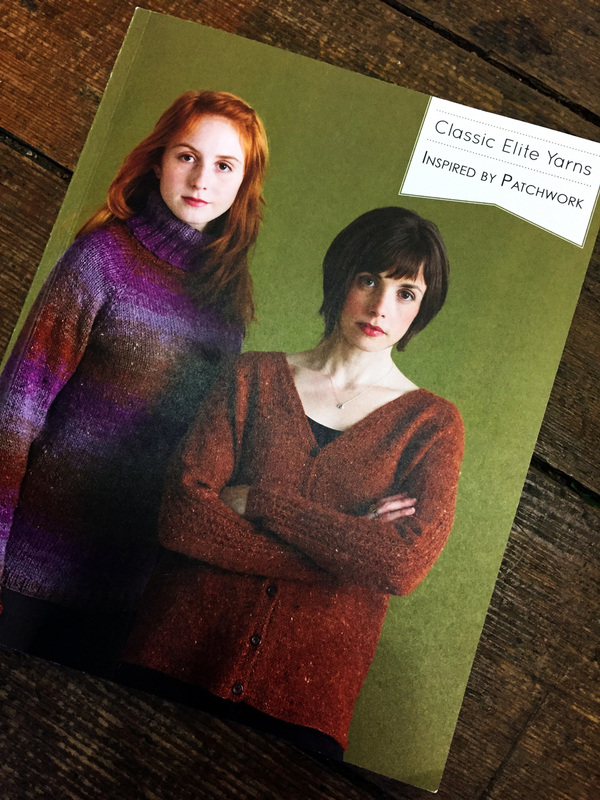 This month we have the Classic Elite Trunk Show from the Patchwork booklet in the shop. These are garments made from the Classic Elite lines: Fresco, Inca Alpaca, Telluride, Soft Linen, and Blackthorn. They will be on display until January 26th. The best thing....get 20% OFF any of the Trunk Show yarn lines until then! 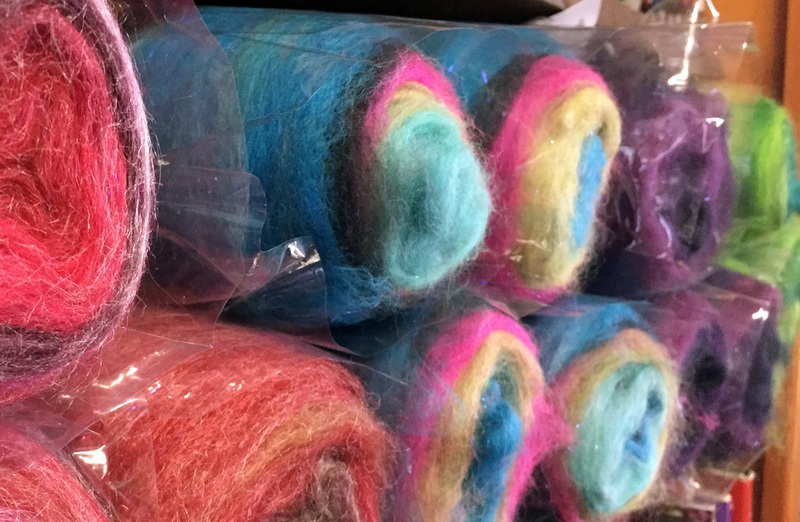 Also, for the Spinners and Felters out there, we just got in a large shipment from Frabjous Fibers! This includes Self-Striping Bumps, Colorshift Top, Felting Fibers, 3 Feet of Sheep, and more! Come to our Knitters' Sanctuary! Annual Open House November 8th! First, and most importantly, the Weaving Dept. is having a SOCK DRIVE! We will be collecting NEW socks in MEN'S sizes to donate to the STL WINTER OUTREACH. Toe-Up Afterthought Heel Socks is a group class taught by Casey on October 24th. This class is a 4-1/2 hour class with a half hour lunch break (bring a sack lunch!) where you will start and finish a toddler dk weight sock. This class will teach you to cast on for a toe-up sock on 2 circular needles, how to do a stretchy bind off at the cuff, and how to add in a heel after the rest of the sock is knit! Two pair of size 3 circular HiyaHiya Sharp needles, a ball of DK weight yarn, and patterns will be provided. Contact Casey by email: Casey@weavingdept.com or through the shop to reserve your spot or for more information. $48 This class is FULL. Sign Up to express interest in scheduling a second date. We are so excited to celebrate SOCKTOBER, and hope you'll come celebrate with us! New In The Shop and TRUNK SHOW! New in the shop this month, we have Berroco Inca Tweed and Berroco Artisan. We will be having a TRUNK SHOW for the Berroco Artisan from September 26th to October 2nd. So come in and see some lovely yarn and knit items in person! 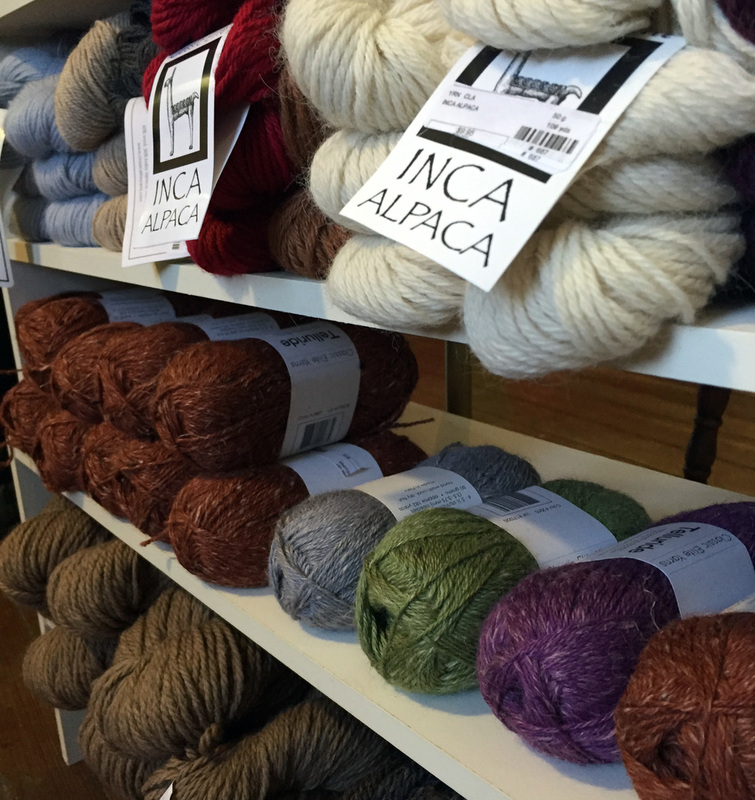 The Berroco Inca Tweed is a Bulky Weight yarn consisting of 50% Wool, 30% Alpaca, 14% Acrylic, and 6% Rayon. We have some shop samples in for you to get a feel for this cozy, warm yarn that's in just in time to knit mitts and hats for winter! 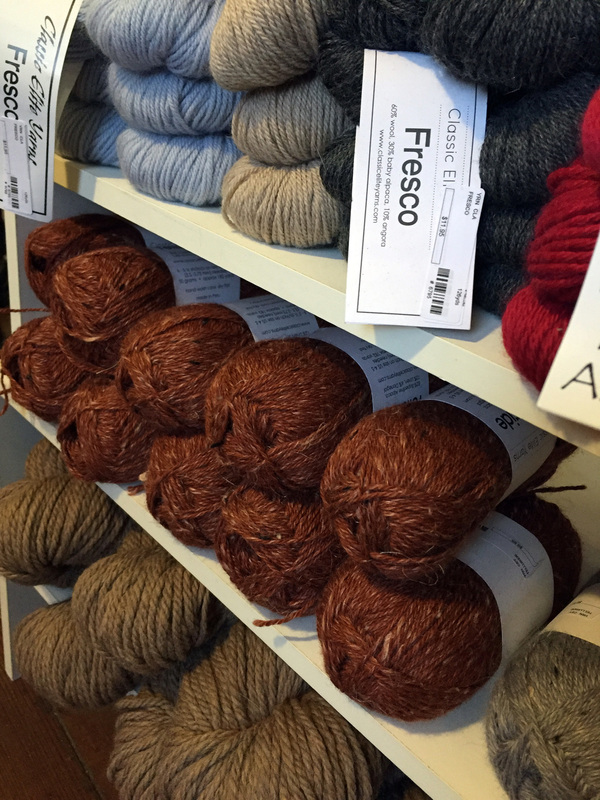 The Berroco Artisan is a Worsted Weight yarn consisting of 80% Wool - Merino and 20% Silk. Come in to see our sample shawl! And don't forget the TRUNK SHOW! It's International Talk Like a Pirate Day on Saturday, September 19th. Come into the Weaving Dept. anytime from 10am - 4pm on Saturday, Talk Like A Pirate, and get a bit o' discount (10%) off your purchases. (Excludes Sale Items - Which are already 30-75% Off!) Savvy?! Need to know how to talk like a pirate? No Problem! First off, you need growl a lot and sort of yell your words with a scowl on your face. Say "Arrrrr!" every now and then and gesture a lot. Always say "me" not "my". For example, you would say "This is me ship", not "This is my ship". Savvy? - Do you understand? Ye - Use this instead of "you"
We are so excited to be launching our new website! We'll be posting about sales, new products, classes, and any exciting events for knitters, crocheters, spinners, weavers, and all fiber lovers. Stay tuned for all the new things up our sleeves!